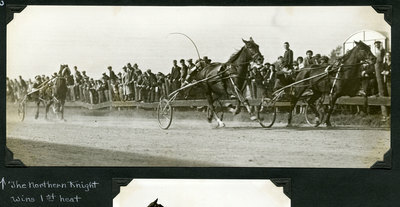 Black and white, finish line action photo of bay gelding Northern Knight, Donnelly up, winning the first heat of the 2.14 Trot and Pace at at the Topsham Fair hosted by the Sagadahoc Agricultural Society, Topsham, Maine, Thursday, October 12, 1933. Finishing the heat in second place is Ed Jr., Jordan up. Showing in third is St. Volo, Hughes up.